President Trump traveled to the summit — which will be the first-ever meeting between a U.S. president and a North Korean leader — from a G7 meeting in Quebec, Canada. 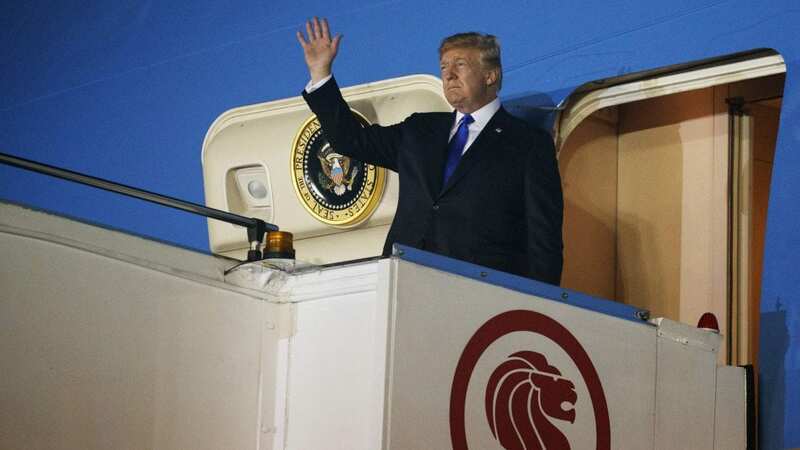 Kim arrived on an Air China jet, NPR’s Elise Hu reports. Singapore Foreign Minister Vivian Balakrishnan shared a photo that showed him Balakrishnan welcoming Kim Jong-Un to Singapore. Later, Kim met with Prime Minister Lee Hsien Loong at Lee’s office in the sprawling palace known as the Istana. A few hours after that, Balakrishnan was on hand when Trump stepped off Air Force One. President Trump has said he will use the summit, scheduled to begin Tuesday, to push for North Korea’s denuclearization. Trump and Kim Jong-Un have both suggested they could also pursue a peace treaty to officially end the Korean War, which ceased because of an armistice signed in 1953. It is unclear, however, under what terms North Korea would agree to in an effort to reduce its nuclear arsenal. Trump has offered few details of what a framework for that process would look like. White House economic adviser Larry Kudlow said Sunday that Trump’s public show of frustration with Canadian Prime Minister Justin Trudeau and other allies was part of a larger plan.